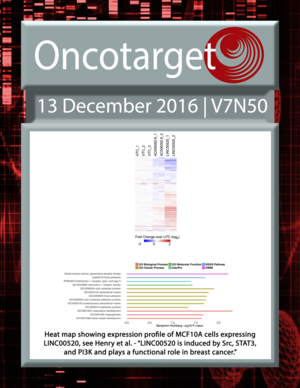 The cover for issue 50 of Oncotarget features Figure 6, 'Heat map showing expression profile of MCF10A cells expressing LINC00520,' from Henry, et al. 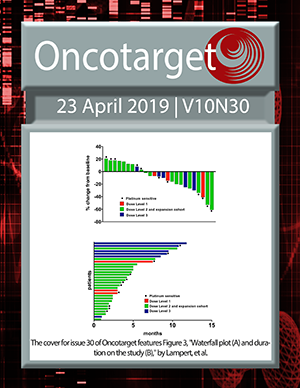 Which TDP-43 aggregates are toxic in ALS? Bryan P. Schneider, Dongbing Lai, Fei Shen, Guanglong Jiang, Milan Radovich, Lang Li, Laura Gardner, Kathy D. Miller, Anne O’Neill, Joseph A. Sparano, Gloria Xue, Tatiana Foroud, and George W. Sledge Jr.